Have you been doing a lot of baking this summer? Unfortunately I haven’t. 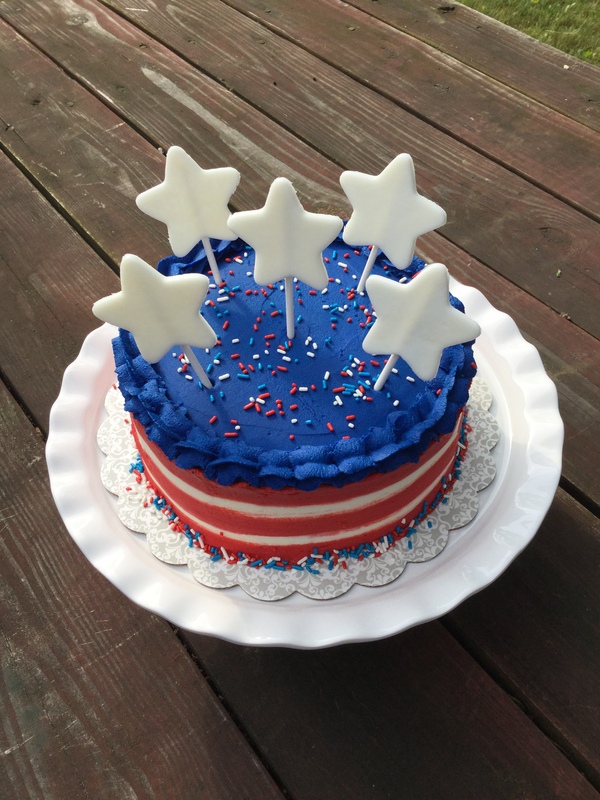 I did my fare share for a July 4th celebration, including the cake below, but, other than that baking has been to a minimum. It’s primarily due to the fact that it’s been a little warm and humid and that coupled with the fact that I don’t have air conditioning does not make for the ideal recipe to turn on my oven. I did make some Banana Walnut Chocolate Chip Cookies and while they were good, they were a bit too cakey for my liking. 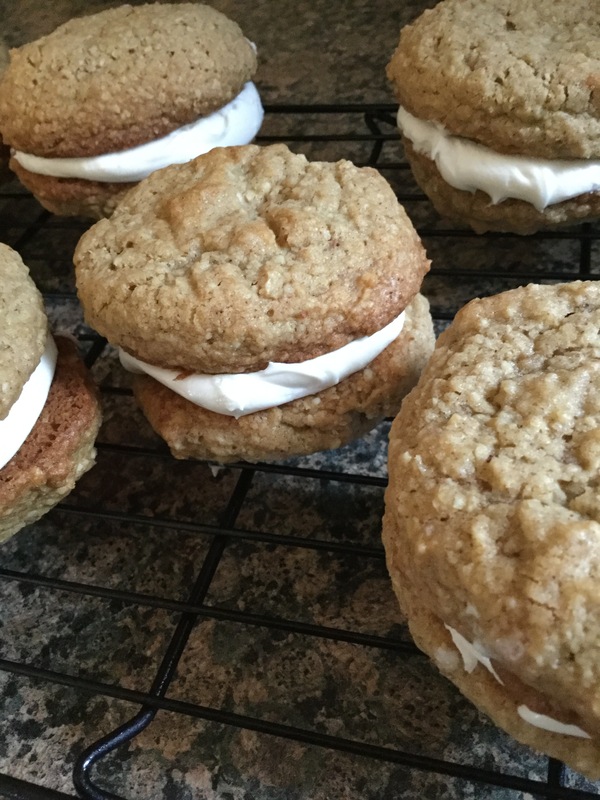 And that brings me to the recipe I am sharing with you today… Malted Oatmeal Cream Pies, a la Little Debbie Oatmeal Cream Pies. 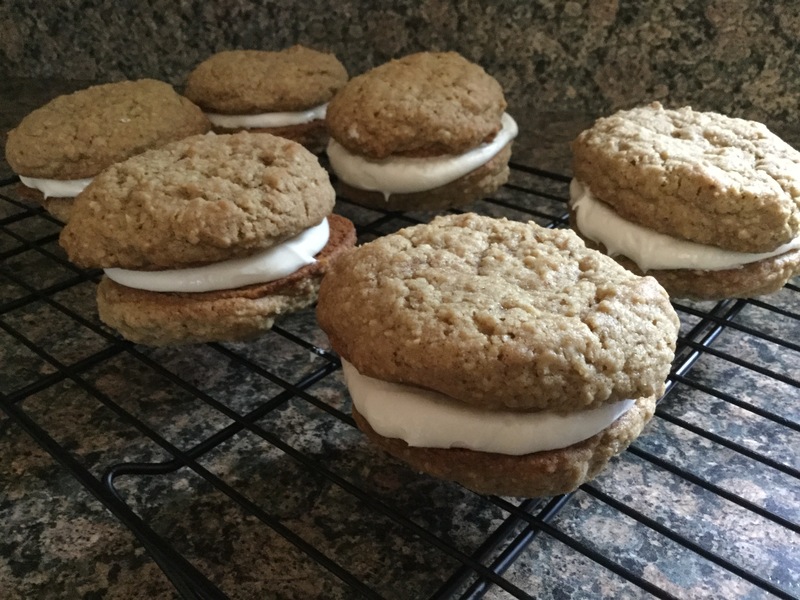 Truth be told, I have never had a Little Debbie Oatmeal Cream Pie, but, when I saw this in an issue of Food Network Magazine last year (yes, it’s taken me that long to finally make them) I knew I wanted to try them. One of the things I liked about this recipe is that you got the oatmeal texture of the cookie without the actual pieces of oatmeal because the recipe calls for you to pulse the oatmeal along with almonds. I think the next time I make a batch of oatmeal cookies I will try that out. What I didn’t like… The size of the pies. The recipe called for the dough to be scooped out in 1/4-cup balls, a little too much for my liking especially since the cookies were pretty thick. I think next time I make these I will keep them on the smaller size, maybe just use a cookie scoop. The cream part though was delish and I wouldn’t change a thing about it. Begin by making the cookies. Whisk the flour, malted milk powder, baking soda, cinnamon and salt in a medium bowl and set aside. In the bowl of a food processor, pulse together the oats and almonds until coarsely ground, set aside. In a large bowl (or using a stand mixer) beat the butter and both sugars on medium speed until light and fluffy. Add the eggs, one at a time, then beat in the vanilla. With the mixer on low, add in the flour mixture until just combined and then add in the oat mixture and beat until just combined. Line 2 baking sheets with parchment paper. Scoop 1/4-cup balls of dough and place on the prepared sheets about 2 inches apart. Freeze until firm. Preheat the oven to 350 degrees and bake the cookies until just golden and crisp around the edges, about 15 to 17 minutes. Let cool on the sheets for 5 minutes and then transfer to a wire rack to cool completely. Make the filling. In a large bowl beat the butter, confectioners’ sugar and, malted powder on medium speed until well combined. Reduce the speed to low and add in the milk and vanilla extract until just combined. Increase the speed to high and beat until light and fluffy. If the filling is too thick add more milk, too thin, add more confectioners’ sugar. Spread the filling on half of the cookies and then top with another and enjoy!